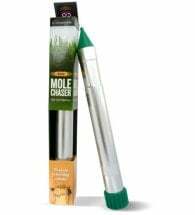 Containing natural castor oil, Dr. T’s Whole Control Mole Repellent helps to rid these destructive pests from lawns, gardens and ornamental turf areas. 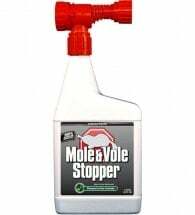 No mixing required, simply attach to your garden hose and spray all areas which show signs of mole activity. 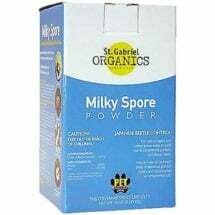 This patented formula is not destroyed by rain and will remain effective for a minimum of one month. Available size: Quart (32 oz) Hose End — treats up to 5,000 sq. ft. Apply when signs of molehills, tunneling and burrowing first appear. Just one application protects up to 5,000 square feet. 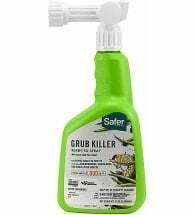 Depending on soil type, it may take up to a week for the product to reach maximum effectiveness. 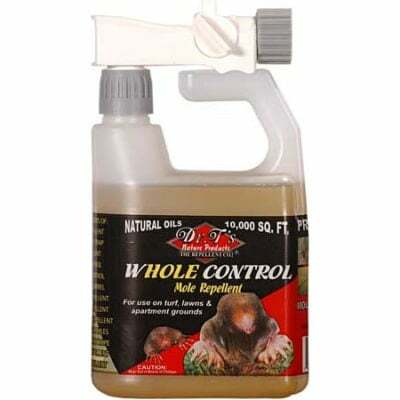 Reapply every 2 to 3 months to assure constant repelling of moles.